Family members who don’t work in the family business are vulnerable to three traps that can threaten or destroy the entire business. In each case, the root problem involves the concept of chain of command. Some individuals who don’t have a business background don’t realize why a chain of command is critical for a smoothly functioning organization. Others simply choose to ignore the chain of command because they don’t believe it applies to them as owners. However, going around a manager undermines the manager. Authority and responsibility need to match, and without it, the result can be dysfunction, chaos, or at worst, a threat to the survival of the business itself. How does this play out in an actual case? And what can be done about it? The Sanchez family is real, but the name and major details are disguised to protect their privacy. We’ll be focusing on problems the Sanchez family experienced with family members who don’t work in the business but who are part owners of the business. The Sanchez family owns a 75-year-old multinational company in South America. However, they recently struggled with three interlocking issues involving chain of command. Unfortunately, these problems led to the loss of three company CEOs in the space of three years. Let’s look at what went wrong and what might have prevented these problems. The first problem involved Alberto Sanchez, a third-generation family member who didn’t work in the business. He was upset that the company was investing in two new lines of business while no longer reinvesting in the original business, the one his family was famous for. He bitterly resented that the core business was being treated as a cash cow to support the new ventures. His resentment expressed itself in demanding lengthy reports from members of management. Further, at every opportunity he’d give directions to staff, letting them know, for example, that they should reinstate last year’s advertising budget for the core business. To add to the problem, he’d point out how short-sighted he felt management’s decisions had been. He was subverting the chain of command. Staff members didn’t know what to do when they were getting conflicting directions—given that what Alberto was advocating was entirely at odds with the directions of the company’s Chief Executive Officer. One executive actually came down with ulcers. Another told me that she would get so nervous before a meeting with Alberto that she’d end up in the bathroom throwing up. When staff members attempted to tell Alberto that he was creating problems, he blew off their concerns. In his mind, what he was doing was entirely reasonable. He explained that he had a right to talk with anyone at the company. And because he had grown up in the business, he knew the history and the players. Why shouldn’t he talk with people who were, at least in part, his employees? In her experience from working with the boards of more than 150 companies over the last 23 years, solving the problem with Alberto requires attention to two key issues. The first involves ensuring that Alberto understands why the board and management made the decision to focus on the two new lines of business rather than on the company’s core offering. In this case, the core business was in a dwindling market, and growth opportunities in the two new product offerings were far more attractive. Either way, it may be useful for the Chair of the Board to sit down with Alberto and talk about the fallout that comes when a family member gives direction to staff. It creates awkwardness and confusion. The Board Chair should invite Alberto to get in touch with him/her or the CEO any time he wants to talk about business issues. In addition, the Chair needs to explain why giving direction to staff is counterproductive. Marisol Sanchez was also a problem – in a different way. The daughter of the company’s founder, Marisol was now the family matriarch. Like her nephew Alberto, she didn’t work in the family business, but even so, as a shareholder whose income depended on the company, she took an acute interest in how the business was doing. Marisol therefore made it a practice to invite members of the staff to tea. At these meetings, she’d ask pointed questions about what was going on in the company. This was awkward for staff members because they knew she was digging around for dirt. Everyone, but especially the CEO, knew she was trying to influence things through the back door. An added irritant was that, although most of the staff hated these teas, one of the staff members loved them. He liked the influence his special relationship with “Señora” gave him. That particular irritant became so great that it was at least a partial cause for why the most recent CEO quit. The case of Marisol represents another violation of the chain of command, with all its attendant dysfunction. She suggested that the Chair of the Board establish a protocol of meeting regularly with Marisol – perhaps once a quarter or every two months. One or two of these visits each year might include the CEO, who would walk Marisol through what’s going on in the business. When a family member is fully informed, he or she is far less likely to engage in “listening post” behavior. In Behan’s experience, some of the most effective board chairs spend a great deal of time interfacing with family owners for exactly this purpose. In the case of a family-owned company, there’s enormous value for the brand to have a family member as spokesperson — a role often played by the Board Chair if he or she is a family member. A company needs a spokesperson so there’s a unified message, and when a family member’s name is the same as the brand, it can be a powerfully persuasive combination. Unfortunately, when family members disagree with each other, it can be tempting to be a back channel to the press. Even when they’re on board with the company’s direction, having more than one spokesperson can dilute the company’s core message. In the case of the Sanchez family, another problem emerged – this one involving family members speaking with the media. Inez Sanchez, Alberto’s cousin, talked about her political views in a public forum, with the result that a YouTube of her comments went viral. Her views were her own, but because her last name was Sanchez, people assumed that her views matched those of the company. While some people loved Inez’s political opinions, other detested them and organized boycotts. The cost of this episode in terms of brand goodwill, family harmony, and staff time trying to clean up after it was close to catastrophic. Behan’s recommendation for avoiding this sort of problem involves family training on the topic of media interfacing. This needs to be done long before any such issues arise. This can mean an orientation or education session for family members. Someone from top management or the board should explain the appropriate procedures for dealing with the press. They should also discuss with family members the pitfalls that can result from failing to adhere to the guidelines. A point person within the company should be identified for family members to contact if they have any questions about making public statements or if they receive media calls. Family members may not like to cede power, but they need to understand that their economic interests are at risk when they don’t follow the corporate chain of command. In addition, the person going outside the chain of command almost never achieves the goals he or she was hoping to reach in the first place. Mitzi Perdue is a businesswoman, professional public speaker, and author of the book, How to Make Your Family Business Last. 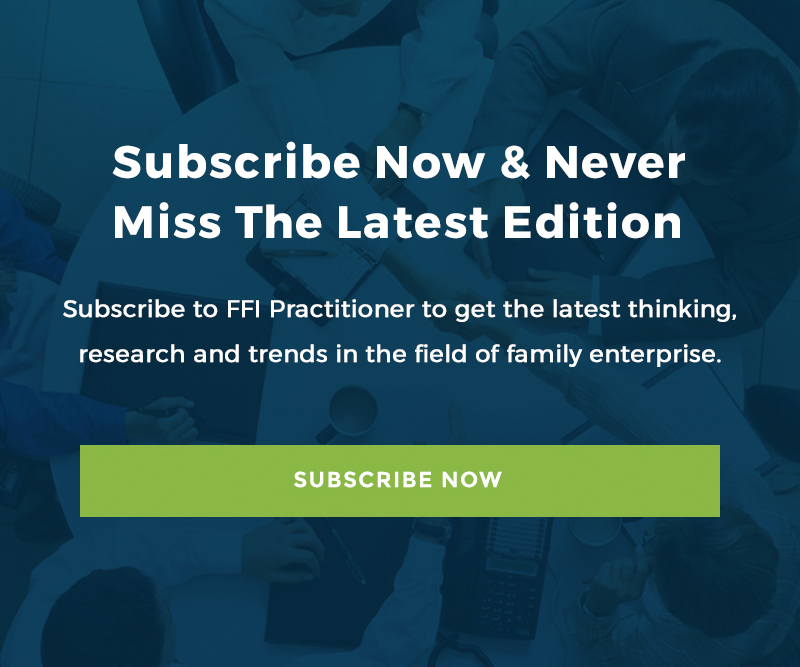 She is a frequent contributor to FFI Practitioner. Contact her at [email protected].